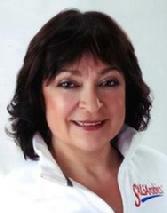 Esther Gutiérrez Sloan, a native Colombian, is the President and founder of SALSArobics, Inc. In 1965, at age 12 she moved with her family to the United States. In 1978 she received a bachelor’s degree from Northeastern Illinois University. In 1988 her love of people, music and dance drew her to change her career and create SALSArobics®, the pioneering form of aerobic exercise that combines authentic Latin rhythms with the steps to popular Latin dances. Esther created and managed the FITKIDS children’s fitness program for the Lake Forest Health and Fitness Institute and is currently the Director of the Youth Fitness Program for the Lake Forest Fitness Center. She also teaches land and water master classes, certified personal trainer and a highly sought after motivational speaker and presenter. Esther and husband, Walt have been married for 44 years and have two terrific daughters.